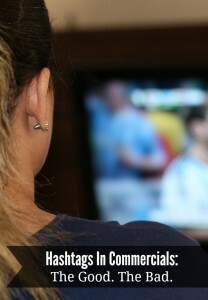 Have you noticed the recent trend of hashtags being used during commercials? I tasked my research assistant to record hashtags that were being used in commercials during a 3-day span. During that time he recorded eleven hashtags. Based on the hashtags recorded, it solidified the fact that my research assistant was a male and watched programming geared towards men. Interestingly, of the 11 hashtags recorded only 2 were branded to include the product name (that’s less than 20%!). 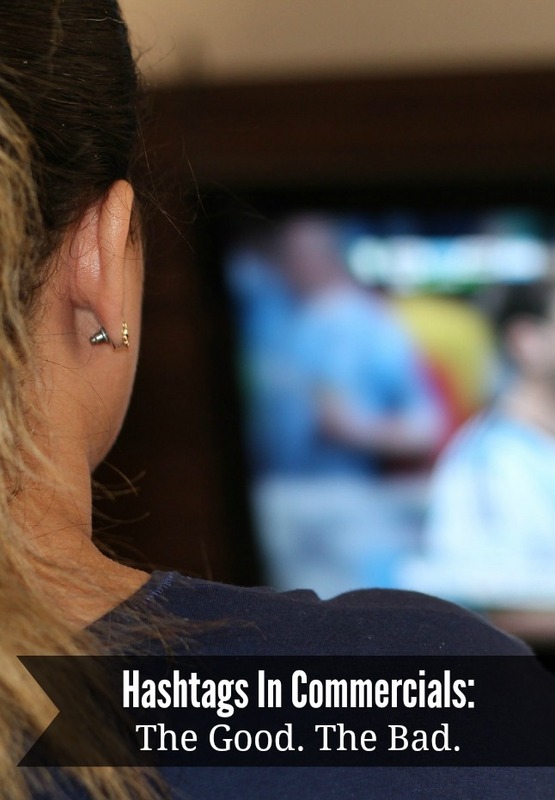 This customized hashtag allows for increased brand exposure, as well as ease in monitoring. 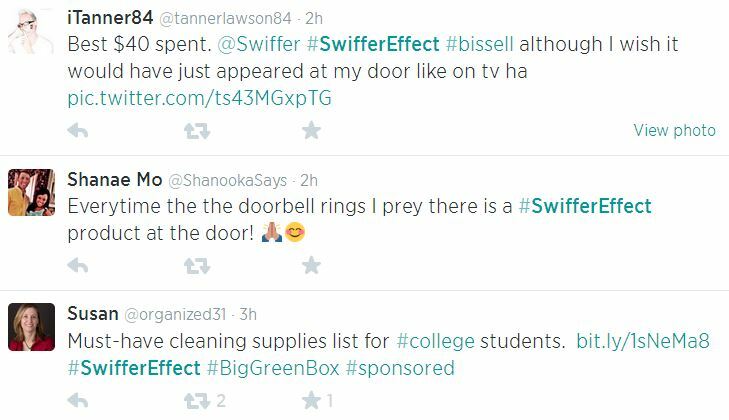 A search for #SwifferEffect on Twitter results in a number of tweets from happy customers, as well as individuals wishing for a Swiffer “Green Box” to be delivered to their front door. This would be considered a pull tactic through encouraging the use of a new hashtag phrase for the purpose of happy customers tweeting reviews, connecting with customers around the world, and interacting with the brand. A great example of a social media campaign done right! Well done Swiffer! On the other hand, Taco Bell implemented a hashtag using a very common word (#finally). In this case, it may be difficult for Taco Bell to gain a solid understanding of the impact of the hashtag used as it relates to the product. A search for #finally yielded conversations about wanting iPhones, students graduating, tattoos, volleyball finals – Taco Bell was nowhere to be found. 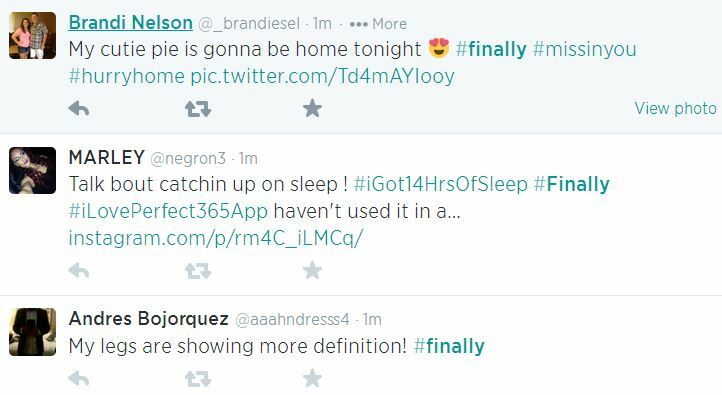 A second search for #finally with both #tacobell and taco bell yielded a few tweets about the Cool Ranch Taco, but there was nothing of significance. Perhaps Taco Bell was implementing a push strategy by developing a presence in the streams of their followers. It begs the question whether this hashtag had an impact on the Taco Bell online community. 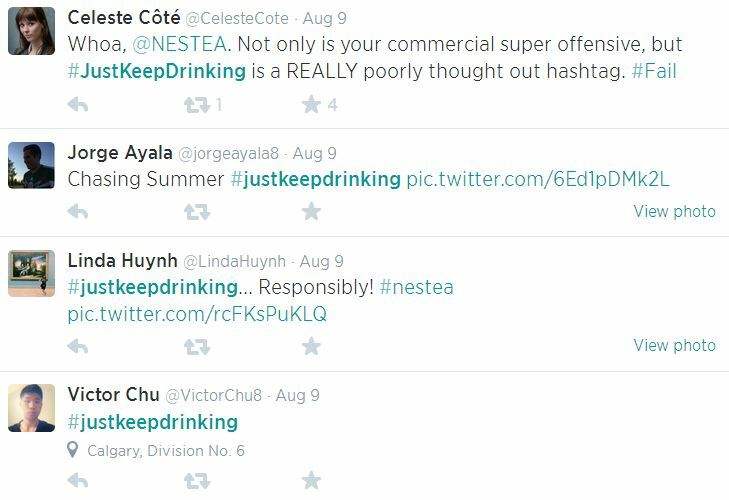 The one hashtag that caught my attention was Nestea’s #JustKeepDrinking. At first blush, this sounds like an anthem for alcoholism, but understanding the demographics for their product, it’s clearly meant to be tongue and cheek. The majority of tweets don’t include text outside use of the hashtag, and many include the words “responsibly.” It is obvious that Nestea has launched this hashtag in conjunction with a strong promotional in-person tour in various cities across North America. This was a great example of a social media campaign used in conjunction with traditional marketing campaign! Then we come to the four-word, and longest, hashtag (#SmallWinsEpicLobster) by The Keg. Since its launch in July 2014, the hashtag has been used in 39 tweets, of which 23 originated from The Keg’s corporate account. It is clear that this hashtag did not reach its performance objectives. It begs the question: “What did this hashtag not gain traction?” Was the hashtag too long? Was it too difficult to remember? Was The Keg targeting the wrong audience? Was the hashtag promoted in restaurants on print material like table displays and menus? 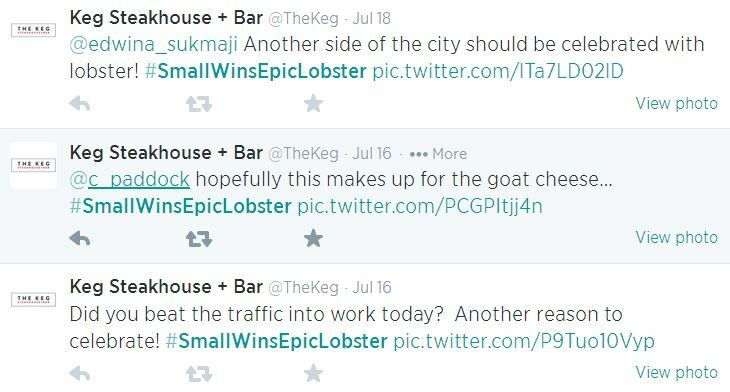 Perhaps The Keg will revisit its social strategy in hopes of developing a #SmallCampaignEpicWin.